Want RSS feeds for vBulletin-powered forums? 5 Responses to Just my bad luck, new watch came BROKEN!! was the box beat up? this is insane. QC issues are unacceptable bc they are relatively easy to fix. make any decisions yet? the box was not beat up, but the watch really wasn’t padded very well. Ming said that all it takes is shock to the crown. Basically the watch was in a small plastic bag inside the red Omega box, but it was roaming freely inside that red box. The red box was placed inside the Omega white box, but there is no padding between the red box and the white box. This is true with our other Omega watches too. Assuming it was really broken during shipment, the real issue was that the white box wasn’t padded well in the shipping brown box. There was some rolled up paper, but it wasn’t placed around the entire white box; when I first opened the package, 3 sides of the white box were touching the outter box, I thought that looked scary but didn’t give it much thoughts until last night. (had a hard time sleeping, kept thinking about it, lol). anyway, had he wrapped the watch itself in a few layers of bubble wraps it will probably be much safer, and would’ve at least minimized the risk of damaging it during shipping. The packaging was actually done at Omega’s shipment center, my AD inspected the watch and made sure everything worked, and then he just removed the original UPS shipping label, resealed the box, and shipped it out. So I guess this is still very rare for both Omega and the AD. It is hard to believe how little thought was put into packaging watches like these, I know relatively it is a rather “cheap” watch, but it is def a few G’s above a “regular” Omega SeMP or moonwatch. The Omega white box was not designed to be good enough for shipping, unlike packaging for stuff like camera and lenses. I can understand this as most watches are purchased in person at ADs, but seems like this is how the watches are shipped when ADs order from Omega USA. well a little bad on the AD’s part not to better pack the box. but then my question is why did the watch come in the little baggie in the red box? my POC inside the red box had the inner felt covered oval insert along with another piece of grey foam to cover it. and the oval insert fits snugly into the “hole” in the red box to secure the watch. what’s the deal with that? but to only have a few crumpled sheets of paper is crazy. if not bubble wrap or those air pillows like amazon has, or at least a ton of crumpled paper (i’ll take a pic of mine to show you my pack job). that’s crazy. 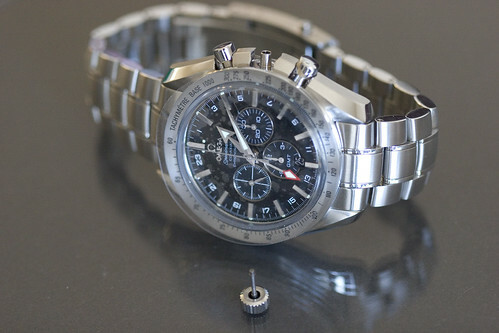 and i dont know what abuse the box was subject too, but does this mean our watches are WAY more fragile than thought? Yes, all Omega red boxes have a hole where the watch sits in, and that has fairly good protection, but the watch was not placed inside that hole when I got it. It was in a baggie, and the grey foam was inside the bracelet (which doesn’t really protect anything! )… The felt piece that is actually designed to be wrapped around with the bracelet was just sitting inside the hole. So I guess the CORRECT way to put the watch in the red box is to place the watch around that felt piece, put it inside the hole, AND put the GREY foam piece ON TOP of it! That would’ve given it MUCH better protection.